From light jogging to a barre class or an ocean swim, if you like to wear a touch of makeup when working out here are the sweat-proof, water-resistant cosmetics we rate. By Editor Trudi Brewer. We're experts when it comes to long-lasting makeup. However, if you like to look your best when you sweat you need cosmetics that will go the distance when you get hot. Here's a simple kit to keep on hand. The core of any cosmetic kit should be a hydrating mist. For a quick change after the gym, Pure Fiji Hydrating Body Mist, $30 cools, and hydrates the face and body instantly. Also, post workout, the exotic tropical scent adds a fresh scent to the skin in seconds. Switch your foundation to mineral makeup. Try Jane Iredale Amazing Base Loose Mineral Powder SPF 30, $77, it won't clog pores, but it does hide imperfections and corrects redness. But it’s real benefit is that it won't slide from your face when you sweat. This powder blots back shine, leaving a gorgeous-looking glow. Pictured here, Golden Glow. To keep brows looking sharp during your workout start by outlining the shape with a long-lasting pencil. Fill in the gaps, where the hair is sparse using light hair-like strokes with The BrowGal Skinny Eyebrow Pencil, $45. This pencil is sweat and water resistant, comes in six natural-looking shades, and we call this an all-in-one brow tool thanks to the built-in spoolie brush, and one-turn sharpener cap. Natural-looking groomed brows last for hours once you set that definition with The BrowGal Eyebrow Gel, $40. Brush the gel through brows in the same direction as the hair growth. This adds separation and maintains the colour you have applied with the pencil. Once set, with this gel you can swim, take a hot yoga class - even spend the night away from home and feel secure in knowing your brows will stay looking on point for 12 hours. It’s a life saver for any style. 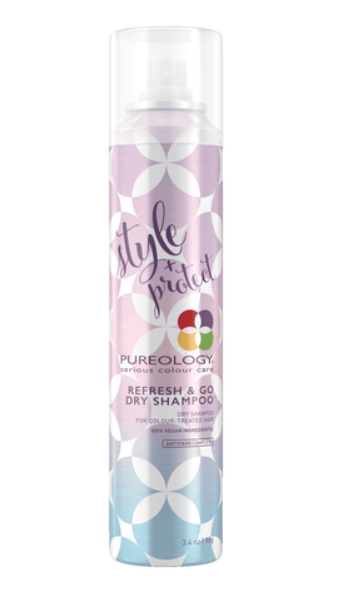 On workout days when you don’t have time to wash your hair Pureology Style + Protect Refresh & Go Dry Shampoo, $44, leaves no white residue and instantly refreshes sweaty locks, leaving them looking bouncy and freshly washed. Black glossy lashes make such a big difference to the overall look of any women. And the bonus you don’t need to wear eye makeup when working out. Lash tinting is a quick beauty service that won’t damage lashes is waterproof, sweatproof and helpful during hot months when mascara tends to smear and cake in the heat. Try a lash tint at About Face expect to pay $45.